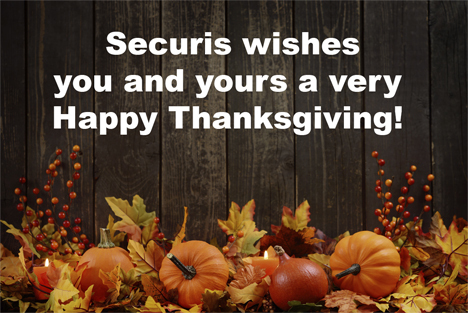 It’s Thanksgiving week here in the US and we’d like to take a moment to thank you for doing business with us. We thought it’d be fun to share some of the other things we’re thankful for this week as well. We’re excited and humbled to announce that The Fairfax Area Disability Services Board (FA-DSB) has selected Securis to be a recipient of a 2015 Martha Glennan Disability Inclusion & Equality Award! Another year of rigorous R2 certification audits is behind us and we’re pleased to share that we’ve again been approved. Not that we were worried, but it’s an intense process and we’re happy to be back to doing business as normal. We’re thankful for pumpkin! Ok, some of us are annoyed by all things pumpkin but the majority of us are excited to try pumpkin cornbread waffles. See how to make them and 16 other recipes using leftover pumpkin here!